A pleasant 6½ mile circular walk from Long Itchington. An easy walk with the opportunity to ramble over open fields and enjoy a lovely extended walk along the side of the Grand Union Canal. The MILLENNIUM WAY section is clearly waymarked with the distinctive black and white circular waymarkers. Find out more about the walk by clicking on the information icon. This delightful circular walk starts from The Duck on the Pond public house in Long Itchington. The village is named after the river Itchen which flows to the south and west of the village. Long Itchington is located around two miles north of Southam on the A423 and has a choice of no less than seven pubs including the Duck on the Pond Just south of the village is the Grand Union Canal. In the village you will find an interesting half timbered Tudor house where Queen Elizabeth I is said to have stayed in 1572 & 1575. The old " Manor House " in the square dates from the 15th century. 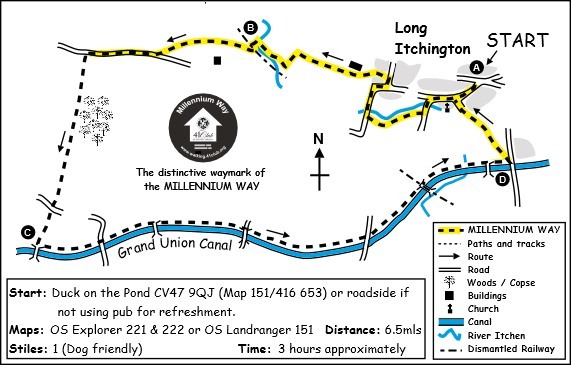 During the first half of the walk you will enjoy the delights of The Millennium Way before turning south on Ridgeway Lane, just before Snowford Lodge, eventually to return via a lovely section of the Grand Union Canal. The walk is just over 6 miles. Emerging from the pub car park, cross the road into Leamington Road keeping the large duck pond to your right, turning left to walk down Church Road. You will pass The Harvester pub on your left, then The Holy Trinity Church to turn left into Bascote Road. Here you have joined The Millennium Way. Cross bridge over river and at the end of wooden fencing ignore stile right and go a further 20 paces to take kissing right gate into field following the black Millennium Way waymarker. Go with fence right to find kissing gate right. Take kissing gate / bridge / kissing gate and ahead with ditch / fence left, ignore kissing gate left and continue ahead up field with river now on right to take far mid fence kissing gate by river bridge, to small road. Go right to cross road bridge and pass 30mph signs following road round to arrive at T-junction, then go left on Short Lane and at end of first house garden take passageway left. At end of passageway take kissing gate and go half left across field to find gap by pumping station. Take gap and metal gate going ahead with farm buildings to your right then through second gate to exit ahead by kissing gate into field. Keep ahead keeping hedge right to reach field corner, then turn left keeping hedge and ditch right to eventually find and take metal kissing gate right in hedge gap. Keep stream on your left and after some 110 paces carefully look for a sometimes difficult to see waymark into the woods. Follow path through woods with river left to cross tubular bridge. After crossing the bridge turn left and after 20 paces go past remnants of metal gate to cross over narrow disused railway line then take metal gate ahead to field. Go left round field for 60 paces to come to field corner. Stop. Go diagonally 3/4 right, across field and under power lines, to find mid hedge gap by a telegraph pole.Take gap and go diagonally across next field towards distant white house to take mid hedge stile. Continue ahead over next field maintaining line to exit by telegraph pole to road. Go right on road and some 200 paces before white house go left through metal gate along unclassified road known as Ridgeway Lane (Here we leave The Millennium Way). Continue ahead towards wood on well marked track with hedge left to reach road. Cross road then continue along track, turn left on to canal towpath just before the bridge. You are now walking along the towpath of the Grand Union Canal. Continue along towpath passing Bascote Locks until you reach Bridge 25. Do not pass under bridge but look out for the small brick-built cubicle next to the towpath. (Here we rejoin The Millennium Way) Go behind the cubicle to take a kissing gate leading into a paddock. Cross paddock, and take two further kissing gates on either side of a farm track. Go ahead over field to take wooden footbridge then continue on to exit by kissing gate and ahead over field towards a modern white house in the distance with a distinctive rear projection and find corner kissing gate. Take corner kissing gate, and turn left to follow a made up lane serving private houses. In a few hundred metres, this lane (Thorn Way) gives onto an open area known as The Square. Exit square and go right passing The Harvester Inn on the right to reach crossroad, go right and come to main road with Duck on the Pond public house. The Tudor House, about 200 yards south of the walk start, on the A423 Southam Road, is said to have been visited by Queen Elizabeth in 1572 and 1575, when it was the home of Lady Anne Holbourne, daughter of Robert Dudley, Earl of Leicester. The oldest part is the 13th C south aisle. The chancel, nave and tower are 14th C.
The river Itchen after which Long Itchington is named flows into the Leam. The river Leam starts in a spring at Helidon and is about 26 miles long joining the Avon between Warwick and Leamington. St Wulfstan was born in the village c1012, he became Bishop of Worcester in 1062 and by 1076 was the only remaining English bishop not to have been replaced by William the Conqueror with a Norman. To the west of the disused cement works is a small Model Village which was built to house the workers in the early 1900’s. The view from the bridge of the disused railway line to the north west is of the junction of the Weedon branch joining the Leamington Rugby line. This line opened in 1851 and closed to passenger traffic in 1959. 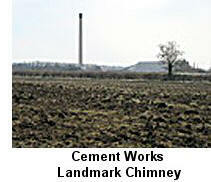 The line remained open for freight serving the now closed cement works in Long Itchington until 1985. Trains for the cement works had to reverse from the Rugby line onto the Weedon branch as the Leamington section had been removed. 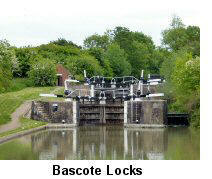 The top two locks at Bascote on the Grand Union Canal, nos 14 and 15, are paired as a staircase - that is the top gate of the bottom lock also acts as the bottom gate of the top lock. Operating a staircase is very different from operating a flight. This is an efficient but potentially confusing arrangement and British Waterways provide a notice giving instructions to boaters. This view from below shows what a substantial piece of engineering they are. The current main line of the Grand Union Canal starts in London and ends in Birmingham (Digbeth), stretching for 137 miles (220 km) with 166 locks.